Note: I’m feeling rather chatty today, so this post might be all over this place. But who doesn’t like a good chat every once in awhile?! It’s been quite awhile since I’ve shot inside my home, mostly because I try to shoot outdoors as much as I can in the warmer months – for obvious reasons – but also because the natural light is only truly viable for a few hours a day. However (I think I mentioned this on instagram), Ryan got me studio lights for my birthday, so I’m now able to shoot indoors any time of day. 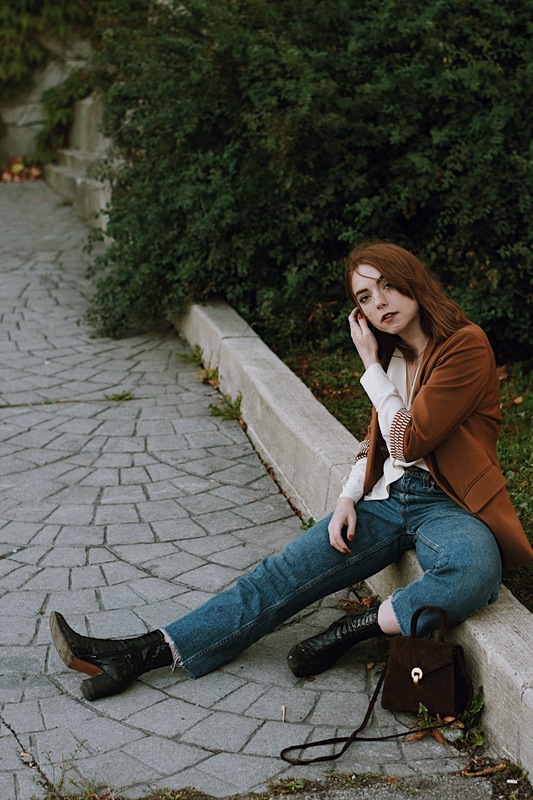 I mostly wanted them for my beauty posts, but I figured I’d give them a whurl for an indoor outfit post and I’m quite happy with the results. I know nothing will truly beat natural light, but I have to say, if you’ve been thinking about getting studio lights, do it; it has really made my life so much easier (in terms of photography, not like in terms of life). Gus has a way of always ensuring he is in a shot when I shoot indoors. He’s pretty much glued to me at all times when I am home, so I guess it makes sense that he would find his way into frame. As you can see, he is doing well (I guess you can’t really see that, but he is). He seems pretty much recovered from surgery and I’m not half as stressed about anything happening to him as I was. His walk is still kind of awkward; he loses his balance often, but he can walk, so that’s all I wanted. In a way, it kind of adds to Gus’ sweetness; he’s deaf and now a wobbly little freak…I don’t think he could get any more lovable at this point. As for what I’m wearing, I’ve been living in these jeans. I know right?! Weird. To be honest, not so much recently because it has been brutally hot, but before these last few weeks I had been wearing them constantly. 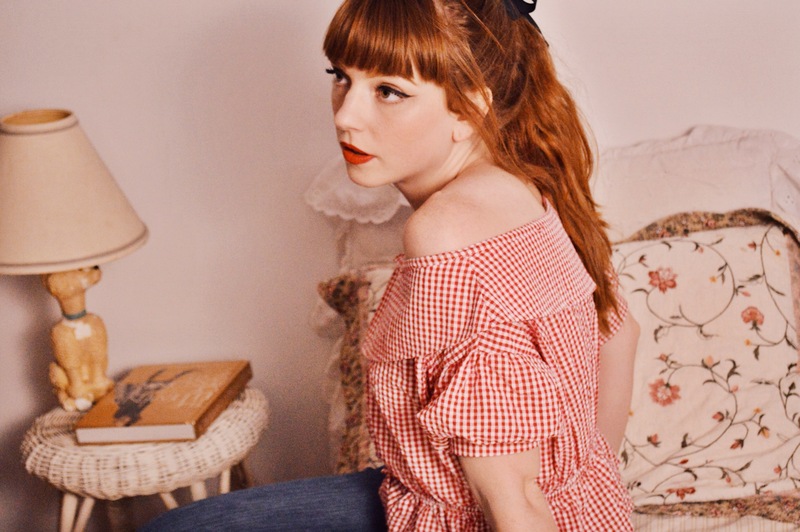 When I received this gingham, off the shoulder peplum top, I knew it would pair splendidly with my flared jeans…as most tops do, actually. The top originally had little straps going over the shoulders, but honestly, they felt kind of useless and looked awkward as they wouldn’t sit properly on my shoulders, so I chopped them off and am much more pleased with this top now. I think this is the one and only off the shoulder item I own, and I kind of love it. The only issue that comes to mind is lifting your arms without everything becoming bunched and weird…do people just not move their arms when they wear off the shoulder? Is there some trick I don’t know about? I’m really interested to know. These are beautiful photos. Your home looks so cozy and lovely. The light is really good, even though it’s not natural. Maybe I’ll pick up some studio lights for myself 😛 You look lovely in that outfit as you always do. And I’m glad to hear he’s doing better. As for off the shoulder tops – I have no idea, I’ve always wondered the same. I highly suggest getting lights. It’s just nice to have the option to shoot at night. I always felt so stressed for time during the day when I needed to shoot indoors, now I don’t have to worry at all. 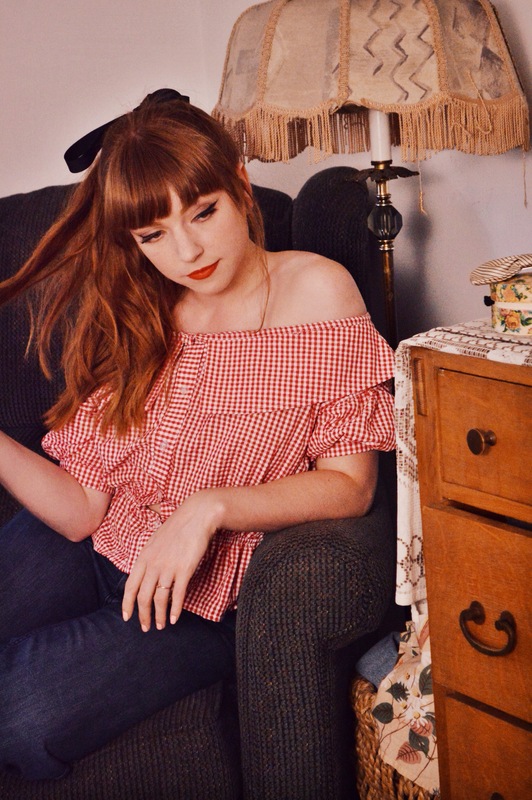 I love how retro and cute these photos turned out. The studio lights seem to work out really well! This top is fantastically summery and Gus is a wonderful accessory to the look! I just found your blog via The Clothes Horse, and have browsed like 2 years of blogging in an afternoon!! 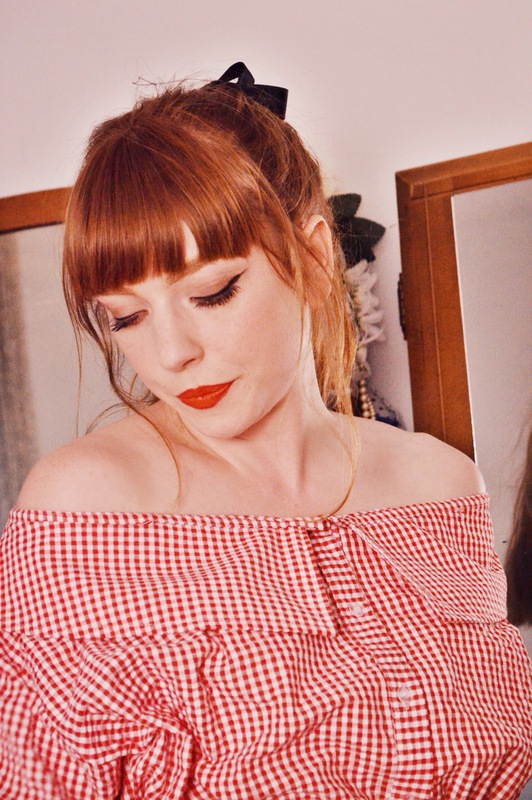 I specially love the 60’s innocent yet risqué vibe some of your pictures have, and maybe because I’m from Barcelona and not at all used to those -20*, I’ve truly loved the way red lips and blak thick eyeliner look against the whiteness of the snow. It really cheers up the landscape!